Everybody likes Marv. He an Al have known each other since their freshman year of college when they were on the same intramural championship softball team. For each of them, this remains the pinnacle of their athletic achievement. Marv still has a job working for a small printing company. It used to be a large printing company. That’s the way the printing business is going. He just hopes to hang on long enough to get his full pension in a few years. Actually, 2 years, 8 months and three days- but who’s counting. He’s got a Bull Terrier he named Bird, after jazz saxophonist Charlie “Yard bird” Parker. Marv loves to travel, loves to eat, and his favorite vacations often combine the two. 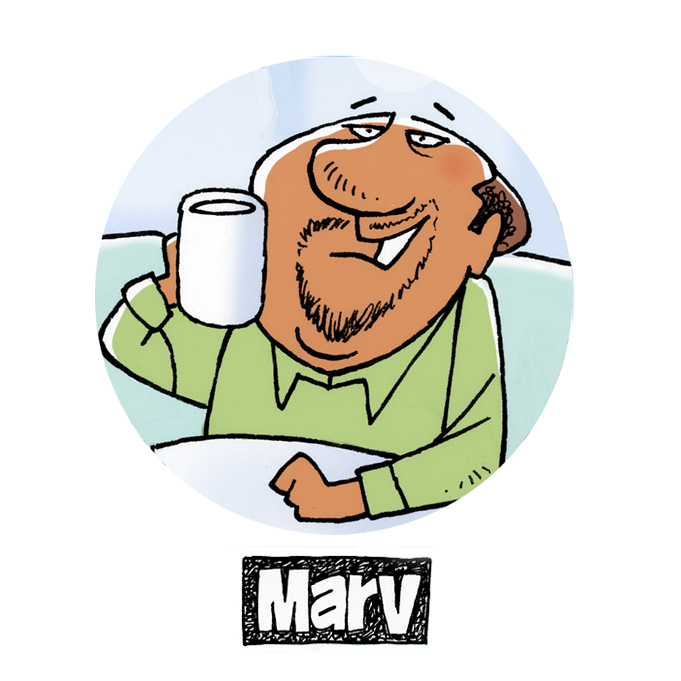 Marv is a sucker for the latest diet or weight loss trend- he once spent two weeks on the “Cabbage Diet.” He didn’t lose any weight and the guys made him sit in a separate booth at the diner. Marv is married to Rachel, his wife of 40 years. They have three grown children.